Located on Morocco's Atlantic coast, Casablanca is the country's largest city and busiest port with a population of over 3.5 million. For many, the name Casablanca evokes the romance of the 1945 film starring Ingrid Bergman and Humphrey Bogart; but the reality of the city is a little different. Although its older neighborhoods boast their fair share of picturesque French colonial and traditional Moroccan architecture, Casablanca's modern identity is all about progress and development. It's not as atmospheric as the imperial cities of Marrakesh, Fez, Meknes and Rabat; but it is a thriving business center full of cosmopolitan arts venues, restaurants and nightclubs. Casablanca came to prominence as one of the most important cities of the Berber Barghawata kingdom in the mid-8th century. In the 14th century, it was used as a key port by the Merinids; and in the 15th century it became known as a safe harbor for pirates. Casablanca came under Portuguese control shortly afterwards. In 1755, the town was largely destroyed by an earthquake. It was rebuilt by Sultan Mohammed ben Abdallah, and was colonized in the 20th century by the French. After serving as a strategic port during the Second World War, Casablanca gained independence along with the rest of Morocco in 1955. It took 6,000 traditional Moroccan artisans six years to build this magnificent mosque, which was commissioned by King Hassan II and completed in 1993. Its towering minaret is the city's most recognizable landmark, while the interior is a masterpiece of intricate mosaics, sculpted plaster moldings and carved and painted wooden ceilings. With room for 25,000 worshipers, it is one of the largest mosques in the world. Respectfully dressed non-Muslims can view the inside on an hour-long tour. Casablanca's medina represents the oldest surviving part of the city, and dates back to the rebuilding carried out by Sultan Mohammed ben Abdallah. Although it isn't as old or as atmospheric as the medieval medinas of other Moroccan cities, it is still a great place to explore on foot. Wander down labyrinthine streets and into tiny storefronts selling spices, clothing and handmade crafts. Haggling is expected, and souvenirs are both cheap and authentic. Keep an eye out for La Sqala, the medina's old Portuguese fortress. Nowhere is Casablanca's uniqueness better showcased than in the Quartier Habous, the postcard-perfect "new medina" built by the French in the 1930s. Intended to represent the marriage of Moroccan tradition with modern French culture, the quarter features shady Moorish arches and arcades, clean stone streets and a sophisticated souk full of excellent souvenir shops. Quartier Habous may not be wholly authentic, but it does provide an interesting insight into 20th-century politics. It is bordered to the north by the Royal Palace. Sometimes referred to as Morocco's South Beach or the Blackpool of Morocco, the Corniche is an oceanfront boardwalk lined with restaurants, nightclubs, theaters and hotels. Stretching for several kilometers, it's a scenic place to go for a jog, take in the sea air or meet vacationing Moroccans. Street performers line the walkway, and the ocean sunsets are often spectacular. In summer, pay a visit to one of the Corniche's beach clubs to escape the heat with a swim. To get there, take a cab from the town center. Unlike Marrakesh, Fez or Essaouira, Casablanca is not known for its authentic riads or atmospheric boutiques. It caters to the luxury traveler with top brands such as the Four Seasons, Sofitel and Hyatt Regency; though our top 5-star pick is the more unique Hotel & Spa Le Doge, an Art Deco gem with an excellent Moroccan restaurant and a decadent hammam and spa. 3-star Hotel Maamoura is an affordable, locally run alternative with 55 comfortable bedrooms and five suites. All rooms include air-conditioning, an ensuite bathroom and free WiFi. Casablanca is a cosmopolitan city with a host of great restaurants. From Spanish tapas to fine French fare and authentic Moroccan dishes, you can find almost any cuisine somewhere in the city. Amongst Casablanca's hidden gems is Petit Poucet, a little café in the old part of the city where Saint-Exupéry, the French author and aviator, used to spend time between mail flights across the Sahara. If you're in the mood to splurge, check out Villa Zévaco for exquisite European cuisine. Rick's Café is modeled after the iconic café in the movie Casablanca and as such is a must for Bogart and Bergman fans. Most overseas visitors arrive in Casablanca via the Mohammed V International Airport (CMN). From there, it's a 45-minute taxi ride into the center of town or a short hop on the commuter train that leaves from Terminal One. 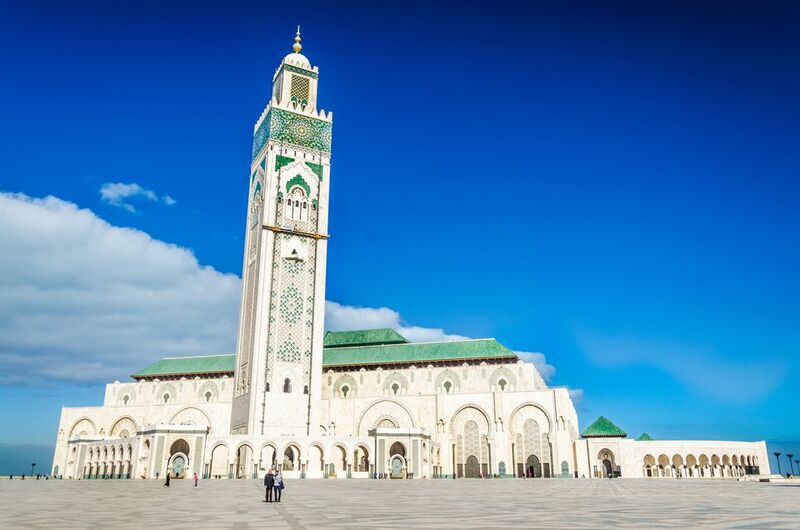 Alternatively, Casablanca Voyageurs train station is one of Morocco's most important rail hubs, and provides direct services to and from other key destinations including Fez, Marrakesh, Rabat, Meknes and Tangier. Cruise ships and long-distance buses operated by CTM or Supratours complete the list of transport methods one can choose from to reach Casablanca.